I got a lot of requests to write an article on how to invest in mutual funds. Many peoples now understand what mutual funds are & how to choose them. But when it comes to investing they find it little hard. So here I am giving various ways by which you will know how to invest in mutual funds. You can invest in any mutual fund scheme either Online (through online investment facility provided by AMCs) or offline (through any financial intermediary or directly walking in any branch of the Mutual Fund Company). Financial intermediaries can be a bank, brokerage house or Individual Financial Advisors (IFAs) or third party distributor. IFAs are AMFI certified ARN holders; those can recommend well-adjusted portfolio suitable for risk appetite of the investor. There are few steps to follow while investing in mutual funds. 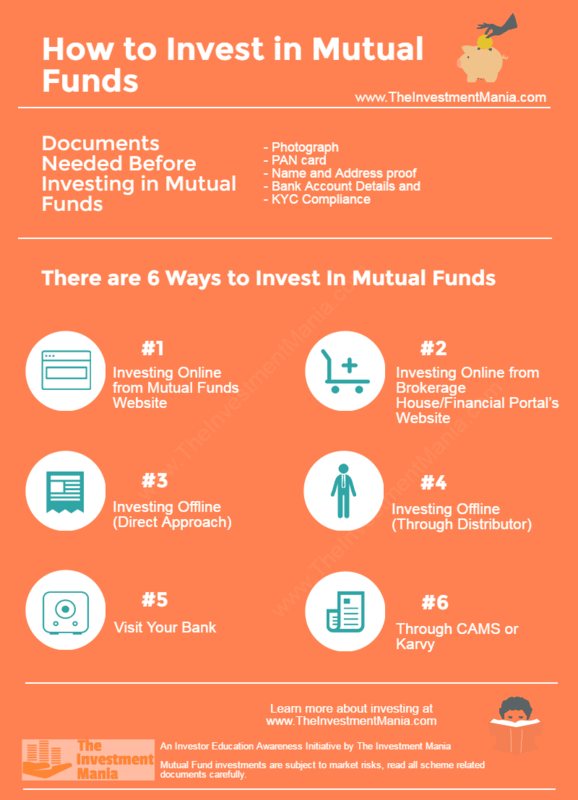 You can invest in Mutual Funds through various ways as shown in below image & let’s see some important information related to it. This is the best option if you can select Mutual funds on your own or if it is suggested to you by your colleagues/friends. The advantage you get here is, you are directly connecting with MF AMC, and therefore you would not be charged any commission. Step 1 – Visit the website and register for online transaction services. Provide necessary information i.e. Name, Email, Phone Number, DOB, Address, PAN number, etc. Step 2 – The F-Pin will be generated and will be sent to you in email id and on registered mobile. Step 3 – Using this F-Pin you can create your User ID and Password. Step 4 – Login using the credentials just created and start investing. There are many online platforms from where you can start investing easily, without much of efforts. The process is very simple & hassle free.Online portals even though not charge you anything upfront as cost, but they will get their commission from mutual fund companies, and that will be adjusted to your NAV. So this option is best for those who are looking for expert advice, investing online, cannot track their investment on time and looking for consolidation of all funds at 1 place irrespective of MF companies. So decide what you want & then select the option. If you have a trading account, you can check with your fund house if they sell mutual funds online. Now a day’s almost all brokerage firms offer investment in Mutual Fund through them. If you do not have a trading account & are considering to open a one, you could check for the firm that sells both stocks as well as Mutual funds. 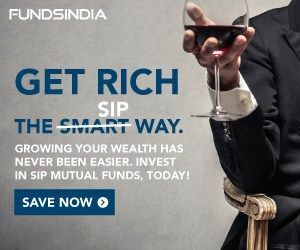 I have given below procedure to invest in FundsIndia site, which I think is best for those who do not have much time to review portfolio regularly, Need experts to manage everything at one place. Step 1 – Visit the FundsIndia website here and register for online transaction services. Provide necessary information i.e. Folio Number, email id and mobile registered with the folio, etc. Some of the best Brokerage Hose are listed below. All mutual fund AMC’s allows you to invest directly. The benefit of this Option is that you can opt for Direct Plan which has low Expense Ratio, which in turn increase your returns over the years. I would highly recommend this if you know which fund is best for your goals. Here is the process to follow. Step 1 – Go to the website of the Mutual Fund company in which you do wish to Invest. Step 2 – Download the Application Form& KYC form from the site. Step 3 – For KYC you need to have 1 photograph of yourself. KYC process is a one-time process. Fill all the required details. Step 4 – Attach copies of the documents mentioned above and submit it along with a cheque or demand draft for the first amount of investment. Step 5 – The very next day mutual fund company then would allot you with a folio number for your investment and would issue you an Account Statement. Step 6 – Now you can directly go to Mutual Funds website & enter your Folio number to start tracking your account. Through Agents or Brokers-This is the traditional way of investing in India since a long time. In this option the agent comes to your doorstep and do all necessary formalities like collecting necessary documents, taking signatures and submitting the forms to the chosen mutual fund companies. In this type of mode, you need to worry about all the processing part. But in this process you must need to know that your MF plan will be Regular (not Direct), so Expense ratio of your fund will be higher by ~0.5-0.75% (depending on the fund), as mutual fund pays commission to your agent from their management fees. See below exact steps in this Option. Step 1 – Contact a Distributor or an Agent of mutual funds. Step 2 – Distributor/Agent will Get the application form. Step 3 – Give all required Documents to him. He will complete all formalities like collecting all documents & taking signature wherever required. Step 4 – The agent or distributor would submit the application form with the cheque and all relevant documents to the mutual fund company. Step 5 – The mutual fund company then would allocate you with a folio number for the particular investment and would issue you an Account Statement. Almost all the banks offer mutual funds through their accounts such as Citi Bank, ICICI Bank, etc. You just need to walk into your branch and ask them if they have the tie-up with the fund house you want to invest in. These Registrar & Transfer Agents act as a single-window system for investors help.These fund houses are like intermediary firms between you and mutual fund companies for record keeping and processing (Registrar & Transfer Agent) and they will be appointed by mutual fund companies (As they may not have such infrastructure to maintain all MF investor documents or have limited service centers). You can invest through them also, exactly same as how you invest in Mutual funds online. Presently they offer online investments only for selected mutual fund companies. But the great convenience of service they provide you is to view your all portfolio at one place, and you can request consolidated account statement from them (irrespective of who the service provider) by submitting your request. 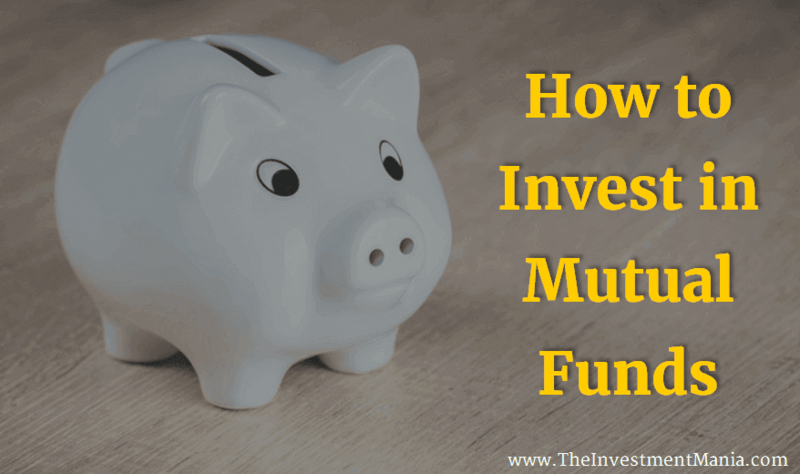 As shown above there are several ways to invest in mutual funds. It all depends on what you have & what you need. If you are completely new & know nothing about mutual funds, then you might want to go with Online brokerage firms like FundsIndia or ICICI Direct, which are best at managing your portfolio with their expertise. If you understand how to choose best mutual fund on your own, then you can go ahead with investing Directly through Mutual Fund AMC. In this option, you will get Direct Plans which can save a lot for you in the long run. I hope you have understood how to invest in mutual funds. Stay Invested. Happy Investing. If you liked How to Invest in Mutual Funds post, please share with your friends. Thanks Megha for the appreciation. As per Budget 2017 which stock / mutual fund is best for long term investment ? Can you please help me out in this ? Hi Megha, Budget 2017 may have a little impact on Sensex but as far as mutual funds are concerned they have little to no impact on these investments are for long term. Still, I have listed few good mutual funds across various categories for your reference. Note that fund selection depends on your risk apetite and goals. If you can provide me with all details, I can suggest more suitable allocation. Amazingly written post on mutual fund investment. Its really helpful for me. Which Mutual fund will choose for investing can please you help me out ? I have been investing in Various funds through SIP in fundsindia. Is investing through funds india is good OR investing through direct funds a better option. Hi Poornachandra, It completely depends upon how much time do you have for managing your funds. If you can spend some time for reviewing your funds, then Direct funds are best because you will save 1 to 1.5% annually per fund. I would like to start SIP in Direct plans, Can you suggest the best way to enter on that..! And can you suggest for Direct plans which one is good to invest either direct company website or fund mediator companies like Zerodha..? Hi Srinivas, Definitely SIP in Direct Plans is good from directly company (no broker for that). You can directly go to mutual fund company website and complete a simple procedure to start investing. If you are not KYC registered, you have to first of all get registered for KYC from any online fund site. See my other article to get KYC verified online. Hope this helps to you. It’s really a nice article for a begineer who is new in mutual funds as well as for those who is already investing in mutual funds. I would like to appreciate for the given article. Thank you so much for giving a detail notes. Thank you Sanjay for the appreciation!. This motivates me to do more. Let me know if you have any queries once you start investing.